UC Berkeley Extension (UCBE), the continuing education branch of the University of California, Berkeley, offers 1,500 courses each year, both in person and online, with more than 75 professional certificates and specialized programs of study in the Bay Area and beyond. Free and low-cost public events are also frequently held as part of Extension’s service to the local community. UCBE came to Principal Builder with one mission: Consolidate multiple educational sites into a single cohesive location in downtown San Francisco. The fast-paced project required us to build out almost 40,000 square feet of new learning space, in under four months, with a budget of $5.1 million. At the same time, it was imperative that this new campus relate to UCBE’s original campus in Berkeley, which meant expressing specific signature visual cues to represent a family of educational institutions. The consolidation included three floors of classrooms – ranging from standard classrooms to art and computer labs, painting studios and mixed use space – three reception areas, open studies, huddle rooms, an educator break room and a main student HUB. Principal Builders was charged with delivering highly specific spaces designed to be conducive to an inspired learning environment – and to seamlessly incorporate the requirements in a way that maximized utility and encouraged creativity. This project required that we move quickly, but stick to the organizing protocols that we implement with every job. It also meant getting approvals and feedback from many stakeholders, including department heads of the various colleges, at every stage, in short spans of time. With classes scheduled to start on August 15th, we needed to complete an accelerated design and construction schedule on a fixed budget. 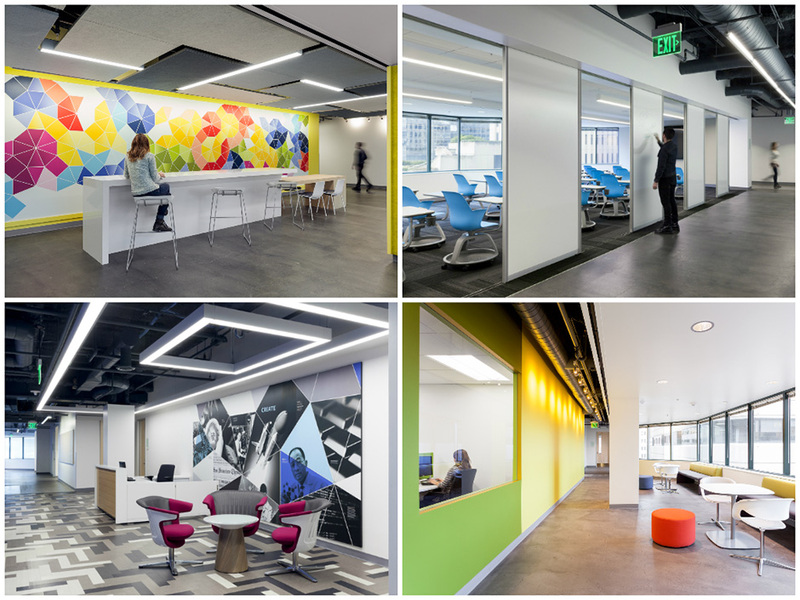 We are particularly excited about the Student HUB, which featured a graphic wall, as well as the 6th Floor reception area with graphic backdrop that showcased academic research and achievement from the SF Bay Area. This wall was where we got really expressive – truly a design achievement. But what we walked away with most is a sense of pride and excitement that so many students will inhabit the spaces, and that great learning will happen inside those walls. Creating something that fosters growth in people is pretty amazing. I cannot overemphasize UC Berkeley Extension’s – and my personal – gratitude to each of you and all of your for enabling us to reach our goal of opening next Monday. Your professionalism, troubleshooting under pressure, and outstanding teamwork (across companies and departments) demonstrates best practices in construction and project management. Know that, although they will most likely never meet you, our students and instructors are very, very appreciative. Thank you!